My first and best fishing trip. I’ve been fishing once. At 14 years old with my best friend Vince neither of us having a clue! All I remember is trying to cast my line into the water and hooking Vince’s shoelaces with my lure! We never saw any fish that day but watching Vince spend an hour untangling his laces from the tiny metal hooks is a memory I won’t ever forget. 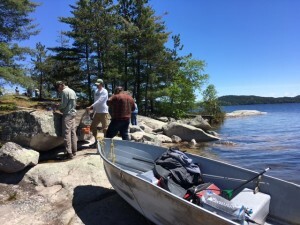 Being a guy who grew up in downtown Toronto, I didn’t have much experience with fishing or camping so, you can imagine my lack of excitement when I was invited to go on a fishing trip 7 hours up north with a group of veterinarians. Part of my work at VetStrategy requires me to attend conferences to meet other vets who are potentially looking to sell their vet clinics. I knew the Algoma Fishing Conference was not going to be like any other conference I’ve been to before! Dr. Andrew Wannan, the owner of Elliot Lake Veterinary Clinic, hosts the conference. When I contacted him, we quickly realized that we’d met briefly in vet school about 15 years earlier and had one conversation at a party that we both recalled vividly. All of a sudden, it was like I had a new friend who assured me the conference would be great fun. I was genuinely excited after that conversation that is until Andrew sent me a list of equipment. One of the items was thermal underwear, and that’s when it hit me ’What have I gotten myself into’? Being a veterinarian, I’ve been working in a world of human emotion and fuzzy kittens so long I’d forgotten I had some manhood inside of me that I could all of a sudden feel. For a guy who has never been camping, I started thinking ’Ya, let’s catch some fish’! Andrew knew I’d spoken at a few conferences and asked if I’d talk during the weekend to fulfill the continuing education mandate for the event. I agreed since I love doing my talk about ‘Avoiding CVO Complaints’ and value the discussion it stimulates amongst my peers. It takes me about 90 minutes to give the presentation, but then about two days before I left for the conference, Andrew told me I was the only speaker and that I had to fill a full 4 hours! This trip kept getting better and better. When the big day arrived, we loaded up the gear and headed to a place called Frontier Lodge, which to this day I still can’t find on any GPS or mapping system! Stopping for a long lunch, I spent some time polishing up my presentation. To be honest, mostly I spent looking for good YouTube videos about epic fishing fails so that I could add more levity to my presentation. When I got back to the car to continue the drive, I decided to call ahead to find out about the technical situation at the lodge and learned there was no cell phone service or internet of any kind ruling out the use of those videos and scaring me a little! Arriving at Elliot Lake Veterinary Clinic, I met my fellow fishing companions. Dr. Wannan greeted me warmly, and it was instantly apparent that this was an extraordinary occasion. It felt like I had just walked into a room of friends who’ve known each other for decades and only get together for this conference. As it turns out, that is exactly the case. The Algoma Fishing Conference has been going for 38 years, and for instance, Dr. John Hancock from Picton Animal Hospital has been attending faithfully since the beginning. There were about twenty-four veterinarians ranging from old to young, large animal to small animal practitioner from all over Ontario. It was easy to see that these gentlemen had been looking forward to this weekend and seeing all their colleagues and friends again. At one point, someone shouted ‘hey, where’s the speaker’! Being the only one providing CE for the weekend, I knew this was me, and my nickname for the weekend had been set in stone. They ushered me outside where a journalist for a small local paper was waiting to interview me. In Elliot Lake, this fishing trip had become local news over the years, and they always featured it. After some food and drink, which included the best clam chowder I have ever tasted, I started to follow the caravan of pickup trucks to Frontier Lodge. The trip was another 45 minutes north into territory that didn’t appear on my GPS. The roads started as pavement, then turned to gravel, then dirt while all presence of other vehicles disappeared other than a few ATVs carrying guys outfitted in camouflage. We arrived at the lodge, and the second I got out, I realized you couldn’t be outside for more than a minute without a thousand mosquitoes treating you like a buffet. The cabins slept four people and in mine was a good mix of veterinary professionals. There was Dr. Doug Riddle, an emergency vet in downtown Toronto at the Central Toronto Veterinary Referral Clinic. Dr. Bob Young, recently retired from Kirkton Veterinary Clinic, a mixed animal practice in St. Marys. And Bob’s son, Dr. Greg Young, an associate at Thames Road Veterinary Clinic in Exeter. Assessing the modest accommodations and small multi-bed rooms, I quickly realized that we would get to know each other very intimately over the weekend. This was not like any conference I had ever been to! It wasn’t the Hilton, but the rustic setting was comfortable, and I have to say rather exciting. The next morning was an early call. After putting on four layers of clothes, waterproof boots, a life vest, personal bug netting and a couple of coats of Muskol, I headed to the pickup trucks. We drove through a path in the forest and were dropped off at the dock where my first experience with portaging began. We had to take multiple trips across the first lake to get everyone across, then trek through a bug-infested forest, across another lake and forest again, all the while carrying a 50lb motor! When I think back to the portaging, I definitely would say it sucked, but the fact that it ends at an untouched, pristine lake certainly makes it worth it. I don’t know what’s wrong with the lake right in front of the lodge, but apparently, that would be too easy. It looked pretty pristine to me, but I suppose its all about the journey, not just the destination. So, onto the fishing. It was an incredible day, and out on the lake, there was a sanctuary from the endless assault of mosquitoes and black flies. Working with the unfamiliar equipment became a fun challenge and a sense of relaxation, that I hadn’t felt for months, set in. 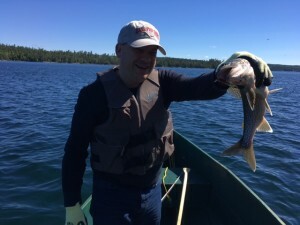 My fishing partner was Dr. Nathan VanderLinde from Baywood Animal Hospitals in Midhurst and Barrie. He was able to help me figure out what I had to do and was a great guy to spend a few hours with. Then the inevitable happened I caught a fish. It wasn’t the most enjoyable experience removing the hook from its mouth, but thankfully, it was my only catch of the weekend. Catching a fish just spoiled the relaxation! Other guys caught a dozen. It’s clear that experience is more important than luck in fishing! Then came the highlight of the weekend ’shore lunch’. We pulled the boats up on a rock island, and the guys broke out camping cookware and got down to serious business. Over the years they had perfected the meal, and I have to say, it was an incredible experience. Dr. John Hancock cooked vegetables and made wraps. 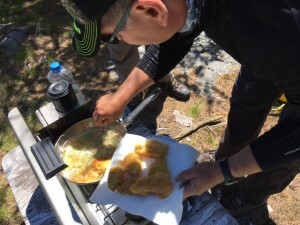 Dr. Michael Ethier and Vladimir Stojanovic, two incredible specialists from the Toronto Veterinary Emergency Hospital in Scarborough, battered slices of fish and fried them in oil which created a burst of flavour beyond my best expectation. It would be on a top ten of best meals I’ve ever had! After lunch, there was more fishing and more drinking. By the time we got back to the lodge, I was exhausted. We moved to the communal dining hall where the rowdiness and camaraderie extended into the evening and it was here that I learned how special this conference is to everyone. Some traditions ran deep and which I don’t want to devalue by sharing the details, but I can say that there was also deep emotion among the group. Since the conference had been running for 38 years, there have been members from the start that are no longer with us. It’s in this lodge where they are probably remembered best and spoken about with great love and respect. The founder, Dr. Dennis Prodan, was mentioned and spoken about with high regard. It’s clear that I was being invited into a unique family that cares deeply about each other. It was a great privilege. I had been warned ahead of time about being the presenter to this group. I was told that this could be a tough crowd based on previous experiences where members walked out during a boring presentation. My topic of discussion was about avoiding complaints from the CVO, our licensing body. This is an issue that always engages veterinarians and brings out lots of different emotions, but mostly anger. I didn’t get any hecklers, and it was evident I won their respect. The group went on to discuss my presentation at times throughout the weekend which confirmed, in my mind, that I added value. I was told that Dr. Dennis Prodan had a long and well-known history of fury towards the CVO. So my topic seemed to strike a chord with the group, and even though many of them spent a career in veterinary medicine, I was able to give them new and different perspectives on the topic. Sunday came, and it was time to go home with my one fish and one hundred mosquitos bites. Andrew was an incredible host, and he forcefully wanted to know if I had fun and if I would return. With the membership getting more mature, the portages are becoming more of a challenge, and he wants to make sure there are some semi-younger members can carry a motor through the forest! Strangely, I’m looking forward to carrying that motor again. It’s called a fishing conference, but the fishing and the conference part is not what I remember most. I can’t quite put my finger on it, but what I experienced is a feeling you don’t find often.